With the third Expendables flick on it’s way out the door and into cinemas, the novelty is starting to wear thin. Or at least it was, until some ruddy great genius at Lionsgate decided, instead of licensing a terrible game, to approach Broforce developer Free Lives. The result: Expendabros, a free standalone game with 10 stages of explosions and guts. Getting to fight Mel Gibson is a nice bonus. Expendabros pits seven new bros against Conrad Stonebanks – Mel Gibson – and his army of ne’er-do-wells across forest-filled Eastern Europe levels. Almost identical to Broforce, but with new locations and bros, it serves as a pretty great demo for the full game. It’s temporary though, and will cease to be available for download come December 31st, 2014. That still gives you a good long time to grab it on Steam. 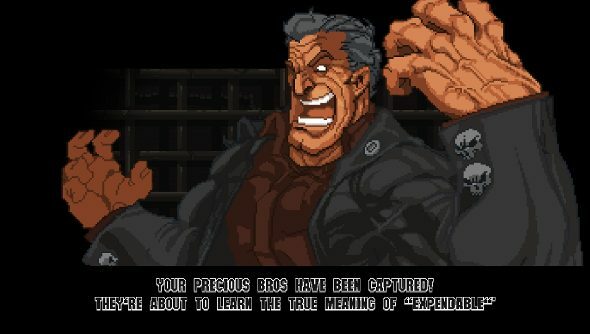 Like the Broforce, Expendeabros comes with 4-player co-op, so you can bring down Mel Gibson’s evil empire with your bros. The main game is still on Early Access, and you can pick that up for just over a tenner.